You know it’s summer when women in Los Angeles begin wearing mini-skirts and flip-flops. Oh wait, that happens all year long. Nevermind. For the last few days, it’s been around 90 degrees (yes, you should be jealous), inspiring me to wear halter tops around the house and make sangria. 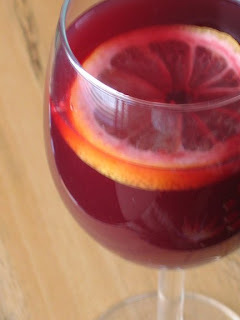 I’ve made sangria about 5 different ways, and this recipe is my personal favorite so far. As an added bonus, sipping sangria while watching American Idol this week made the moments with Barry Gibb a little less painful. In a large pitcher or bowl, mix together the rum, sugar, orange juice and wine. Float slices of lemon, apple, and maraschino cherries in the mixture. Refrigerate overnight for best flavor. MUST TRY!!! What’s your red of choice to mix in? Hi, tubetone! I’ve used both Cabernet Sauvignon and Merlot. The Cab makes the sangria more fruity (which is how I made it this time around). Using a Merlot gives it a nice dry flavor. mmmm, sounds great for the summer.